Dealing with odors coming from heating vents can be maddening, particularly when the odor smells of rotten eggs or dead animals.You'd like to think your house is not only clean but tightly sealed against invasion from the outside. Unfortunately, though, microbes and mice often find a way into walls and heating systems from the surrounding soil. Traps dry out or freeze, and small children and their pets can squeeze objects down into floor vents that should never be there. Tracking down those odors is never simple, but several starting points may help. Heating systems provide paths for odors. Identify the vent (or vents) from which the odor emanates. Remove the grate and examine the approach -- the connection to the main duct. Remove any debris and use vinegar or lemon juice to swab out the metal surfaces with a string mop head. Climb into the crawl space or walk down to the basement and identify the duct that feeds that vent or runs along that side of the house. Inspect the duct for breaks and tap along it to find any rodent bodies. Locate any gaps around water pipes, gas or air conditioning feed lines and caulk or fill them with patching cement. Small animals can squeeze in to find shelter, end up in the air exchange system, following food smells, and then die for lack of nourishment. Look for cracks in the floor or foundation or dampness that might serve as breeding places for mildew or mold. Repair cracks and use a dehumidifier or high-volume air mover to dry the area. Move your air conditioner unit's drain tube so that it drips away from your house's foundation if it is dripping toward it. Run hot water in tubs and sinks and flush toilets that are not used frequently. The seals on sewer traps may have dried out, allowing sewer gas to escape from fixtures into walls or into the basement space to be drawn into the furnace intake. Clear snow from plumbing stack vents; wrap them in black tape to prevent freezing, which can also lead to unequal pressure and leaks. Call your utility company for an annual furnace inspection. Mention the odor and ask the technician to inspect your electronic air filter carefully if your furnace is equipped with one. Ask her also to check the pilot light to make sure it operates properly. Ensure a supply of fresh air to your furnace. 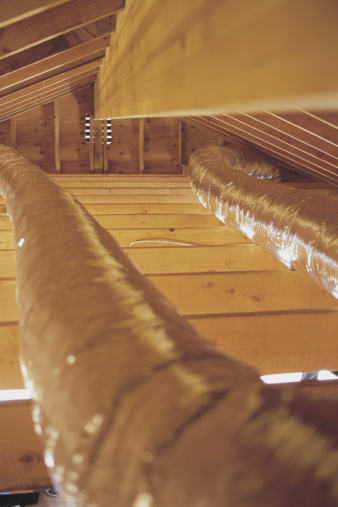 Tightly sealed homes can create a situation called negative pressure or depressurization that draws in odors that would normally vent through gaps and attics through the heating system. How to Find What the Odor is in My House? I Have a Dead Mouse in My Heating Vent: How Can I Get Rid of the Smell?